I haven't really been myself lately. Work is crazy and the heat and I haven't bought anything new. To be clear, I'm far from a shopaholic: I don't regret purchases and I don't buy on impulse. My job makes me far too aware of what's out there that something would ever take me by surprise and sweep me away. But I do have a carefully considered list of things I want, a look I'm trying to build, both at home and in my wardrobe. And when I buy nothing new for weeks, I feel like it's becoming a pipedream and I'm one of those people who says they want all kinds of things and never moves closer to them. I think the frustrating part might be entirely that I thought I would reach an age when these seeming fundamentals would be taken care of... But now I think maybe that same realization is what drives people to the ultimate fantasy wishlists; the realization that even the doable list never gets done, so in a sense it's an ultimate fantasy too. I'm a big fan of optical effects, lenses and convex mirrors... especially after reading Hockney's Secret Knowledge. 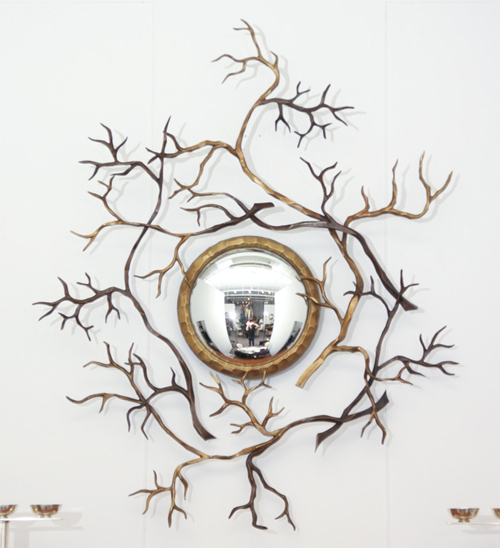 I love this mirror by Herve van der Straeten. Today, I checked out the new Irish Park by the waterfront in Toronto. 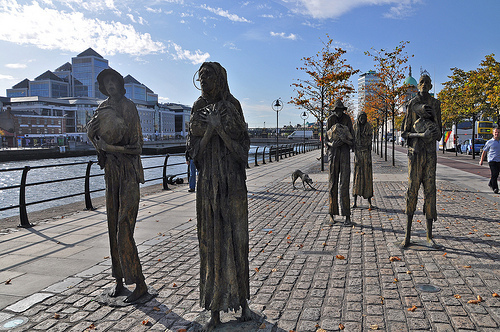 I thought about the contrast between the journey the famine-victims made here versus the one I made - the same route, under very different circumstances. I have great affection for Rowan Gillespie's sculptures in the park, which mirror the departure sculptures on the Dublin docklands. It's lovely that my new home is tied to my old one by this split collection. I don't own a digital camera. I have an old Pentax K1000 and while everybody else was out getting digital, I was in a darkroom learning how to print on fibre-based paper and no doubt giving myself cancer. Those were the days! But, I think I'm ready to shake off my luddite ways. 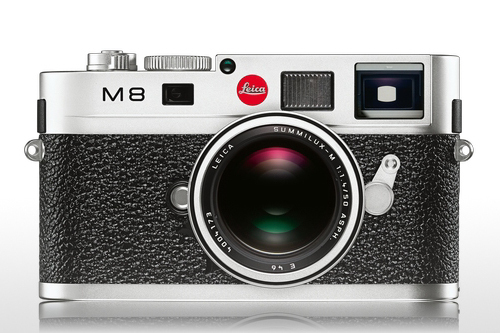 Unsurprisingly, Leica got me there. For years, I've pulled clippings from magazines of things I liked. 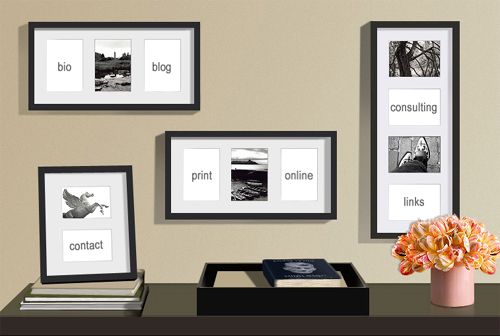 From interiors and flower arrangements to shoes, clothes and purses, jewelry. When I started blogging, it was an immediate opportunity to create a soft-copy of all those little scraps of paper, that I loathe maintaining. So, some of my posts have represented that archive of clippings and some have been new things that I've come across as I trawl the stores and magazines. I always thought of each clipping as something individual and distinct that I liked. After all, it's hard to draw a parallel between a table, a purse and Beckett. But, somehow, the format of the blog has created an overarching coherence. If I was a branding person, I might be tempted to say that's "my" brand. But that seems too self-conscious. For me, it's more about how these things express something about me, not just as individual items, but now as a collected group of objects assembled in this format. And as I continue, I'm becoming more aware of this expression when I look at new things. Maybe this is what it's like when you identify your own style and learn to create something that syncs with you, yet is impossible to express and so remains somewhat ineffable. It's not just about coveting these things. It's about what that coveting says and where it collectively points to. 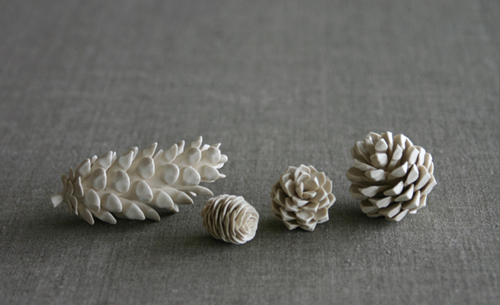 I nipped into the Gardiner and saw these lovely ceramic pinecones fromCoe & Waito in the museum store.Just beautiful in person! 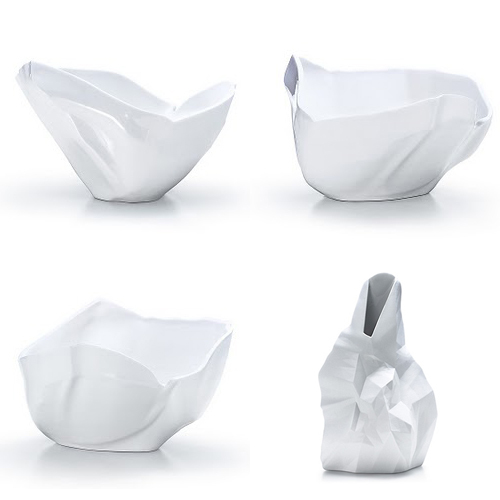 I'm loving these Rock vessels by Frank Gehry from Tiffany. 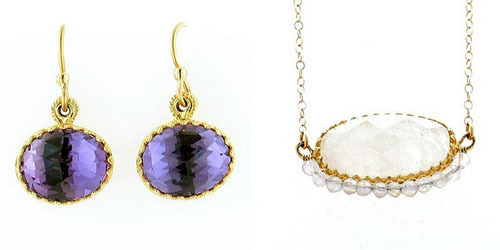 I've been coveting some earrings from Becky Kelso at Augustina every time I go in. But on Moondance, I also fell hard for this moonstone necklace. Santiago Calatrava is at work again in Dublin. And, what's more, he's building a bridge for Beckett. I wonder if he's doing a bridge for all our literary heroes? He's already done Joyce of course. 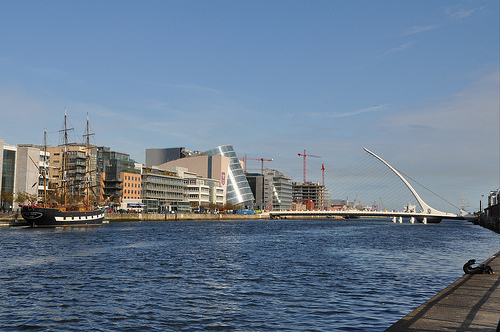 Maybe, Calatrava bridges will become the litmus test for Dublin literary merit... More about Beckett, the bridge, here. I'm reading 2 books right now: A Beckett biography and Divisadero by Ondaatje. All it takes is one great Beckett quote and I'm swept away "...this sky that soars above its ballast dust." And there are so many layers in Beckett. You can riff off the words and meanings of the words or their sound and rhythm or the translations. Or you can just take what's said and linger in the silence between. Beckett gives you so much choice as an reader. I love the feeling that I may not ever get it fully. Which is exactly what it's like when you interact with a person. And in the tinkering around with all those layers and all that silence, Beckett abandons any attempt to pin things down so much that they seem unreal. 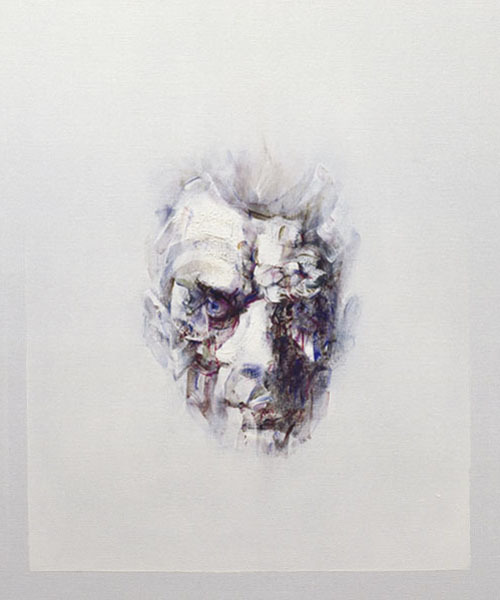 This portrait is by Louis le Brocquy. 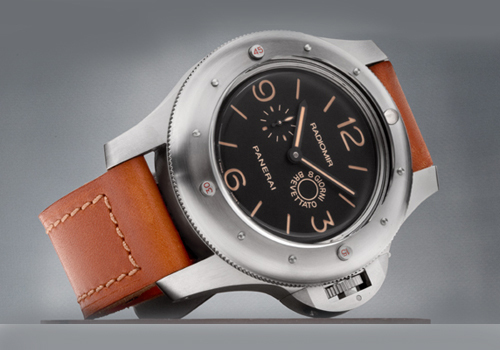 If its scale wasn't so exaggerated, this is the watch I'd covet the most (from Panerai). Check out the origins too. Super cool. Tomorrow, I'm planning to check out some highlights from Luminato. 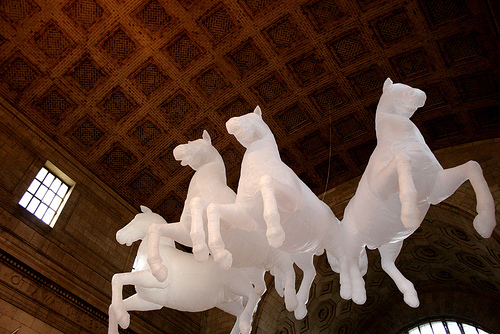 Leonard Cohen is in town for it and there are all kinds of installation pieces around the city, including a huge mobile in the BCE Place (my favourite Toronto building) and giant inflatable horses in Union Stn.